From the Sailing Quarterly Video Magazine library. RECOMMENDED: Rent or Download-to-Own the series with Unlimited Streaming through Vimeo. Individual episodes sold separately. 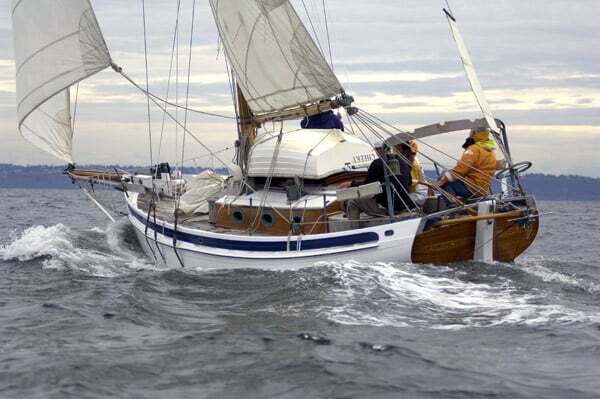 In sail racing tactics, Gary takes you aboard a variety of sailboats to provide hands-on lessons. He uses animation and graphics to visualize concepts like wind shear and starting techniques that will help you get your boat out in front. Individual sail racing tactics include the Role of the Tactician, Tools and Tactics for Reading the Wind, Tuning up Your Boat and Crew, Starting Tactics, Mark Roundings, Match Racing, Instruments & Polars, Target Boat Speed, and Tactics for Offshore Racing. 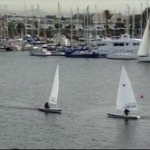 CLICK HERE to buy or rent individual sail racing tactics videos or the entire series through Sailflix Vimeo On Demand. TACTIC 103E: The Role of the Tactician - 5:39 MIN. TACTIC 104C: Reading the Wind Part 1 - 5:39 MIN. You cannot see the wind but you can learn how to read the wind. America’s Cup tactician Gary Jobson shares great tips on how to watch the water, other boats, your instruments, sails and put this all together to be able to read what the wind is doing and will be doing to your boat. Get the edge by practicing these skills and you will be out in front even in light air. TACTIC 201E: Reading the Wind Part 2 - 5:25 MIN. Gary Jobson with more on tools and tactics to practice in reading the wind. TACTIC 602C: Tuning your Boat for Racing - 10:12 MIN. Gary Jobson’s advise for tuning your boat, rig and crew the morning of the race. Plus what to practice as you head for the starting line. A thorough check list of the important items to test, check and practice before the start. Go through the motions before the critical time when you are racing. Be prepared. TACTIC 102D: Starting Tactics - 4:48 MIN. Tips from Gary Jobson for maximum speed off the starting line complete with racing footage and explanatory graphics. TACTIC 303D: Match Racing Tactics and Strategies - 7:53 MIN. Gary Jobson explains the tactics, strategies and rules that we will be seeing during the America’s Cup match races. TACTIC 202D: Instruments and Polars - 5 MIN. Gary Jobson explains how to use your instruments and a polar chart to achieve your best speed and angle to the mark. TACTIC 203D: Achieving Target Boat Speed - 6:38 MIN. Gary Jobson explains how to steer and trim your sails to achieve target boat speed and shows how tips work on small and large boats alike. TACTIC 504C: Offshore Racing Tactics - 11:43 MIN. Gary Jobson explains his tactics on a 60 mile point to point race from Miami to Palm Beach. Experience the thrill of the chase plus starting, navigation, currents and more. Gary first assigns tasks to each crew, then he takes us through the details of a strategic start and continues with offshore racing tactics using the Gulf Stream for an assist. We measure ourselves against the competition using simple tools like a hand bearing compass. Lots to learn that can be applied to any sailing adventure and fun too.